On est très proches, ma soeur et moi. We are very close, my sister and I. We're going to the cinema tonight. This use of "on" is for a specific group of people of which you're part: e.g. 'My friends and I'. Here "on" includes Men/people in general, or can be a theoretical statement such as"one <does that>". On ne doit pas parler la bouche pleine. People mustn't speak with their mouths full. It seems Kwiziq is counting things as unanswered when I have answered them. Also, how do I get to take the quiz again after looking over the material again? Re-post using the Help & Support feature under ‘Tools’ as this is a language forum. Greetings! Could someone please tell me why «On ne peut pas stationner ici» cannot be translated to “one cannot park here?” ...thank you! I guess that the options to the multiple choice question don't necessarily have to contain all possibly correct answers. You're just supposed to choose from among those given. But I can't tell for sure because I don't know the exact question and set of answers. Thanks Chris for taking the time to respond. My apologies for not including the set of answer choices that came with the question. I will post them when I find them :). Great day to you! where do we use on? I'm not sure what you mean by where? In what kind of situation? 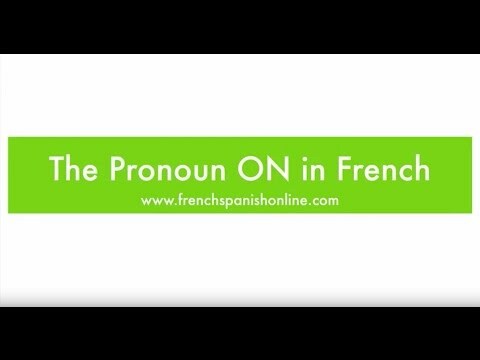 On is more informal than nous. So in writing and formal situations, you'd use nous more often while you'd use on in casual conversations and writing (like texts and emails to a friend). Pense-t-on que Caligula était fou? Yes, pense-t-on means "Does one think..."
It could also mean "Do we think" but the inverted form of the question, which is used primarily in a higher register of French, clashes with the more colloquial use of on meaning "we". So, to make a question, just inflect `On dit/peut dire que Caligula était fou? Good point about mixed registers, thanks. Also, On can be used to refer to ''you'' as in lots of people but I thought that was the translation/ role of Vous? Vous as a plural pronoun adresses a specific group. You--group of people--that I'm talking to right now. On is more general and also more...all encompassing, for lack of a better word. Vous ne devriez pas vous battre-- You two people that I'm talking to shouldn't fight. I hope that helps (and makes sense). Sorry, if my questions may sound dumb but i am a curious person. Not satisfying my curiosity can keep me in a blank world of confusion. Technically on is the equivalent on "one" meaning one hypothetical person. In English, we also conjugate this in the third person singular. "One is" not "One are" even though "One is responsible for ones own life" can very well mean "We (people) are responsible for our own lives). On mange du fromage ce matin? Do you have a question, Jane?